17 February marks Racial Justice Sunday, which focuses on the experiences of ethnic communities in England and Wales. It is a day on which we all called to earnestly pray for an end to racism and racial inequality in our country. The theme this year is Dignity of Work, looking at how all people must not be exploited or face discrimination and hatred in their work. 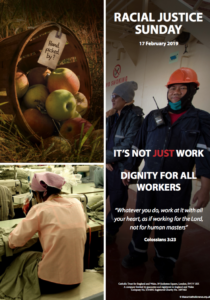 In our task as disciples of Christ, our responsibility is to make sure people are treated with dignity at work and are not exploited. Migrant communities and those suffering from racial abuse are particularly vulnerable to being drawn into unjust working conditions and labour exploitation. Do you know a church-based social action project that’s improving health and wellbeing in their community?